Frisco Ridge, Yukon - Available 8/28/2014. DO NOT DISTURB OCCUPANTS. 3 bedrooms, 2 ½ baths, 3 car garage, 1,914 sq. ft. (est. ), built in 2006 in the Frisco Ridge Addition. Spacious home with fireplace, wood floors in living & formal dining, crown molding. Kitchen has center island, walk-in pantry, pot filler, gas stove & eating area. Master suite has double vanity and full bath. Large utility room with sink and lots of storage. Covered front porch, fenced yard, big covered patio, sprinkler system & professionally landscaped. 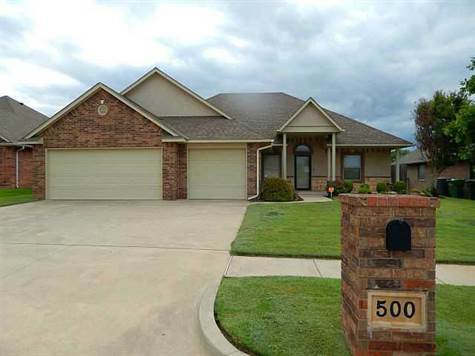 To view this home, please call (405) 313-6820 or (405) 285-2635 (office) or rentals@elitereandleasing.com (email). Visit our Website at: www.RentalHousesOKC.com. Available Monday thru Saturday to Show. Rent: $1,695. Deposit: $1,695. Pet Deposit: $300-$500 per pet - No Cats. Directions: W. on Yukon’s Main St past Garth Brooks to Frisco Ridge, S. to Swingman Rd.